PLDT Home Boost is the new product of PLDT which you can stay connected without worrying your monthly bills.You can avail PLDT WiFi Prepaid promo starting from 15 to 599,you can control your monthly internet bills according to your budget and lifestyle. Top up for this product is worry free you can reload any PLDT/SMART store nationwide.Selected kiosk and reseller are also have access to convert your regular load to PLDT Home Boost Promo. Reminder: Required load to register to avail Home Boost is 15, 50, 100, 349 and 599. 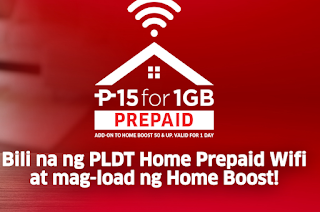 1GB data add-on to other Home Boost loads for only 15 pesos. Register: Text BOOST599 send 4122. Once promo selected has been sent, wait for the confirmation before we use the service to prevent loss of regular load.